My favorite bushes, the part of spring for me. 1. Lilac's Is my favorite bush there is no flower as beautiful and aromatic as Lilacs. 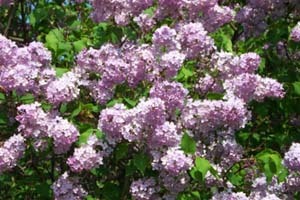 Lilacs have a stronger scent than any other plant, bush or flower! In my opinion,and the scent carries quite a distance. Unfortunately, Lilacs bloom for only a very brief couple weeks in the spring. To prolong their presence in your yard, grow a variety of Lilacs, including, early, mid and late varieties. With variety and luck, you may be able to see Lilacs in bloom in your yard for up to six weeks. Weather will have a lot to do with how long your bloom last. Once the buds begin to open, pray for a cool dry spell. Once the blooms are over, you still have a nice shade bush, but you have to wait for up to fifty more weeks to see them again. 2. Snowball bush. Bright white blooms look like cheerleader pom-poms You get flowers in mid spring and they last through much of the early summer. This ornamental shrub’s dark green foliage will take on tinges of red or purple in the autumn months. The Snowball Bush is an easy choice for a decorative or showcase piece. It can also be used in border or foundation plantings, as part of a hedge . 3.Butterfly Bushes It is not only the vast amount of color that butterflies and I enjoy but also the heady honey-like aroma. Each tiny flower has a nectar filled tube which is just right for butterflies and hummingbirds and they make me smile. These are my 3 favorite bushes some day I want my whole yard filled with them! The one last thing I wanted to mention is that if you look to your left you'll see an add for SOSBUZZ whats cool about this company is that if you use them when you shop for anything you want or need they give you 50% discount and then 25% of what you pay goes to the charity of your choice, pretty cool I think. oh I looooove lilac's...honeysuckle(or as I like to call it..sonnyhuckle..and gardenia are my fav's.